SKIWALKING.COM LLC and The American Nordic Walking System launched an industry first this year with the introduction of 32 different lengths of quality one-piece Nordic Walking Poles from SWIX of Norway and EXEL of Finland. Our commitment to providing quality one-piece Nordic Walking Poles has resulted in a record number of happy customers and our continued #1 ranking with Doctors and Physical Therapists. A ranking that poles with cheap/flimsy twist-locks or twist-locks could never achieve. And at the same time we officially started to sell and promote the NEW Carbon VIP Poles. After extensive test marketing and providing free upgrades to hundreds of customers we decided to increase production to 32 different pole lengths in both the original VIP’s and the NEW Carbon VIP’s. This NEW Carbon VIP has received rave reviews. The extra wrap of “carbon” makes these poles extra durable and ideal for fitness walking, hiking, trekking, backpacking, for athletes, for weight loss, for added balance and stability during rehab and physical therapy, for seniors ………..
ALL of the walking poles from SKIWALKING.COM LLC and the American Nordic Walking System come equipped with comfortable patented “NORDIC” straps, removable rubber tips for pavement and hard surfaces, plus metal tips for off road – dirt, grass, the beach, the sand dunes, snow, and ice. All poles come with a free DVD and printed instructions. What’s next? In 2017 we will introduce a new DVD and the first Nordic Walking Book based on the American Nordic Walking System. Questions? 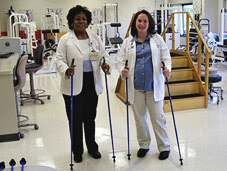 Please call us for honest advice and quality walking poles.